Today, as I put on my cap and gown and receive my diploma from USC, I’ve been thinking a lot about where I came from and where I’m going. I was born in Los Angeles to a single mother from Guatemala. Six months after my birth, my mom’s visa expired and with no work, we returned to her homeland. In Guatemala, as the daughter of a single mother, I quickly learned to appreciate anything she was able to give me. She found a way to finish college while raising me and her dedication helped me realize the importance of drive and hard work in achieving your goals. When I was 5, my grandmother passed away from a heart attack. I was really impacted by her death and decided then that I wanted to help save people’s lives one day. I thought the best way to do this would be as a doctor but as I got older, I realized medicine was not my passion and I came to love computers and technology. When I was 16, I was part of a program in Guatemala that exposed students more deeply to computers and software. From then on, I knew that developing new technologies was what I wanted to do – I decided I wanted to be an engineer. I chose electrical engineering because I still wanted to help save people’s lives and I saw this field as a way to design devices that would do just that. As my love of engineering grew, I wanted to attend university in America. But I had no friends or family in that country, and my dream seemed impossible. I put my dream aside and enrolled in school in Guatemala. After my first semester, a family friend took a trip to the U.S. and invited me to go along. Knowing this might be my only chance, I took the flight with the hope of finding a way to enroll in a school (any school!) in the United States. But as the end of my trip neared, I had no luck. I was prepared to go back home, disappointed again. Just a few days before I was set to leave, I met a retired doctor from Cuba who I made an instant connection with. She let me stay with her, and I worked for her cleaning her home. She motivated me to stay in the U.S. and stay focused. I didn’t have the money to afford school, so I kept working and saving money. I enrolled in Crafton Hills Junior College in Yucaipa with the goal of transferring to a 4-year university. My dream was hanging on by a thread, but it was still alive! The transition from the Guatemalan educational system to American one was not easy, but with the help of counselors and staff (and more than a little hard work) I was accepted to three universities. The acceptance letter from USC was the last one I received, and I had already committed somewhere else. I was still really interested in USC’s engineering program and the different opportunities for research and involvement that students had there, so I decided to visit the campus. When I first walked onto USC, I fell in love with it. I knew that this was the place where I was supposed to be. After this visit, I cancelled my attendance to the other university and transferred to USC to pursue a degree in Electrical Engineering. I never looked back. When I started my first semester, a feeling of gratefulness and accomplishment overwhelmed me. The dream that started as a 5-year-old girl in Guatemala was now a reality. But, I soon learned that the real work was just beginning. My first semester at USC was not easy. I was academically and emotionally challenged like never before. I failed my first set of midterms, and I even thought about dropping out or changing my major. I’m sure I wasn’t the first freshman to be in this situation. Luckily, with the help of my family, mentors, the Society of Hispanic Professional Engineers, the USC Latino Alumni Association, and the USC Caruso Catholic Center, I was able to get up and keep going. By the end of the semester, I achieved grades in the A and B range in all of my classes. I could not have succeeded without so many people to lean on for support. After years of struggling, things started to fall into place, one after another. I kept my involvement with SHPE, and I also joined the Autonomous Underwater Vehicle (AUV) design team. This team works on designing and building a robot submarine which goes to the RoboSub competition every July. Then, in the summer of 2016, I had my first internship with Visa, working as a Systems Engineer. The following semester, I became the Electrical Team Lead for the AUV team. During the summer of 2017, I interned with Microsoft in the Hardware Division as a Manufacturing Engineer. After graduation, I am going to be joining Microsoft as a Validation Engineer. Each and every one of my experiences at USC has helped me become the person I am today. I am so proud to call myself a graduate of USC and yet, it is a bittersweet experience. This has been my goal for so many years. Now that it is actually in front of me, I feel the excitement of a new chapter, but struggle with the realization that I will not be on campus anymore. I won’t be surrounded by my friends. I am going to miss not being in the lab building our little submarine, and going to the Catholic Center to de-stress. In Guatemala, most students don’t have the modern equipment and resources that we enjoy here. When I came to America, it made me appreciate my position even more. That’s why I want to develop programs that give children in developing countries access to technology and to STEM education. There are great minds all over the world and, with a little support, kids in these countries can do amazing things too. “Don’t forget where you came from, but never lose sight of where you are going. Life is a journey, and in the journey that I am living right now, I have learned that hard work, sacrifice, and the support of friends and family will take me where I want to go. Now that I am graduating, I want to tell future generations to never stop believing in yourself, even when you fail. You might not believe it, but there is kind of a beauty about failing. After you fail, there is only one way you can go – up! Never let anyone put your dreams down because it doesn’t matter how impossible a dream may seem, all that matters is how badly you want it. Lastly, don’t forget where you came from, but never lose sight of where you are going. I know I won’t. Andrea Luna graduates today from the Ming Hsieh Department of Electrical Engineering at USC Viterbi. She will begin a job with Microsoft in the Fall. 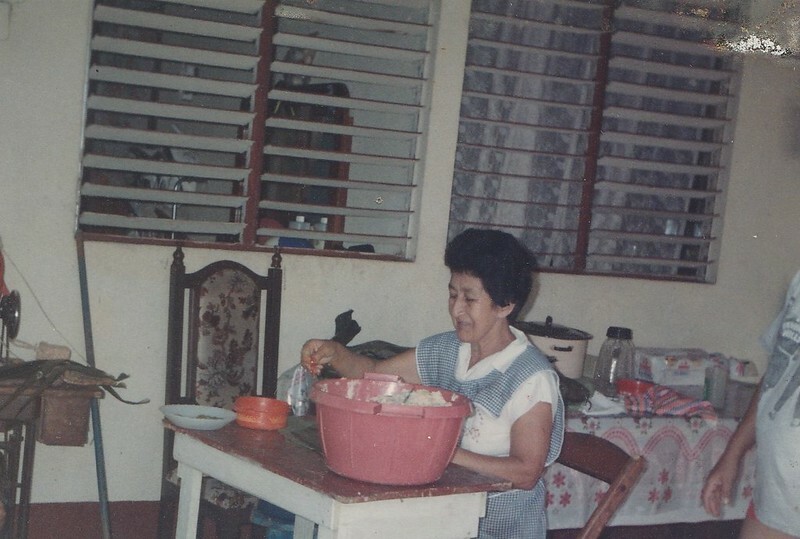 Andrea’s grandmother, Elvira Luna, who helped raise her in Guatemala before passing away in 1998.